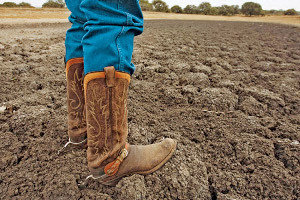 It looks like farmers this spring won’t be penalized for the crippling drought we’ve had in West Texas these past few years. After repeatedly claiming they could not follow the Farm Bill’s strict implementation schedule, USDA announced Tuesday that they will now update the Actual Production History (APH) exclusions for spring 2015. Currently, crop insurance is available to producers as a formula based on that farmer’s average recent yields. A year (or two or three) of severe weather that hurts his production lessens his coverage for the following year. It results in a downward spiral that many producers can’t recover from. But the 2014 Farm Bill included an APH update that allows certain years to be excluded from the formula if the county’s average yield is at least 50% below the 10 previous years. This is especially helpful for our region, which has been plagued with a severe drought. It means our producers will have fair options for crop insurance in the spring. It will help them recover their farms, and our local economy. After repeated requests, I’m pleased Secretary of Agriculture Tom Vilsack finally decided to implement this provision on time. In fact, I asked about APH implementation last time I saw him at the Agriculture Committee hearing in September. This will have a real impact on Texas’ 19th District.